I’m always on the lookout for a recipe that is quick and easy during the winter, especially during the holidays. So when General Mills asked me to create a simple meal with their specialty potatoes, I took on the challenge. Soup is a perfect example of a one dish meal that is filling and satisfies. 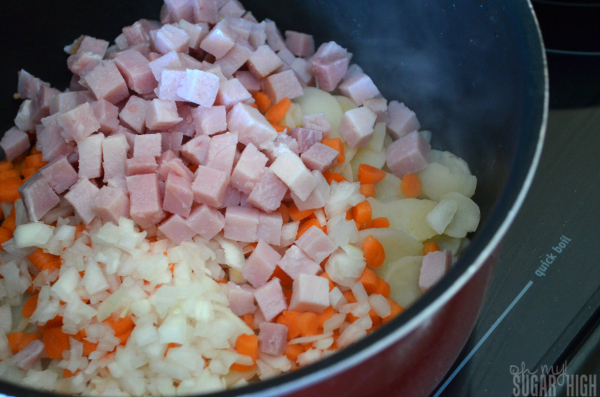 This potato ham soup uses Betty Crocker Specialty Potatoes and eliminates the need to slice your own potatoes. It also adds an amazing flavor to this soup with the seasoning packet. The preparation on this soup is minimal which leaves you more time for family. Feel free to use left-over ham for this recipe. I used a ham steak which is very affordable and worked great for even slicing. This soup was a big hit and was gone within 24 hours. We enjoyed it with bread for dinner and then it was perfect for dunking my grilled cheese the following day for lunch! 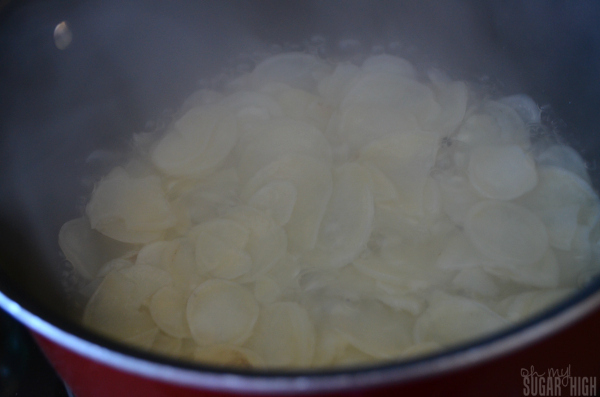 Heat water and potatoes and salt to boiling in large saucepan. Boil for 20 minutes. Drain. Return to heat. Stir in all remaining ingredients, including seasoning packed from the boxed potatoes. Heat to boiling over medium-high heat, stirring periodically. Reduce heat and simmer uncovered until carrots are tender, stirring occasionally. (Approximately 10-15 minutes). Top with shredded cheese before serving if desired. This ends up being a very easy and quick soup. Just be sure to slice your carrots on the thin side so they don’t take too long to cook. If carrots aren’t your favorite, celery or frozen corn would also work well. 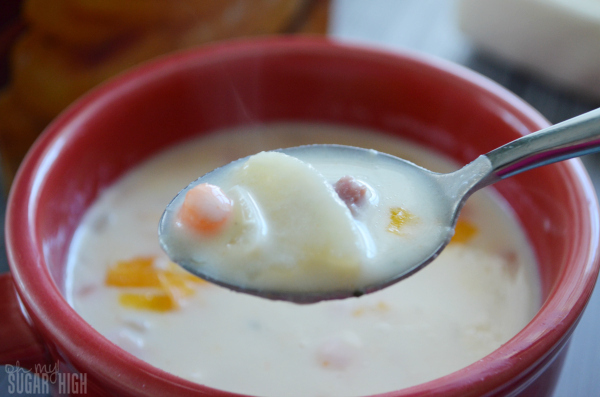 If you like an extra creamy soup, you can substitute the whole milk for 2 cups half and half and 2 cups low-fat milk. The fattier the milk, the thicker the soup! The shredded cheese on top is purely optional but I love the color it gives to the top. 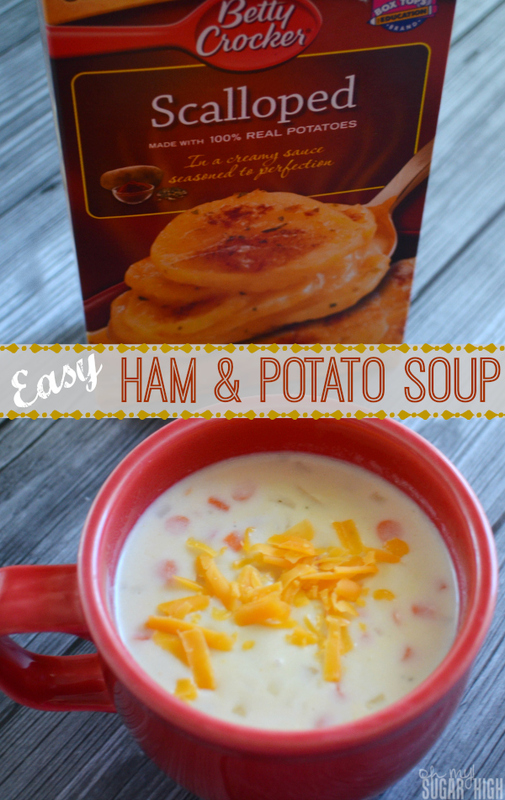 Be sure to visit Betty Crocker Potatoes for more quick and easy meal solutions! 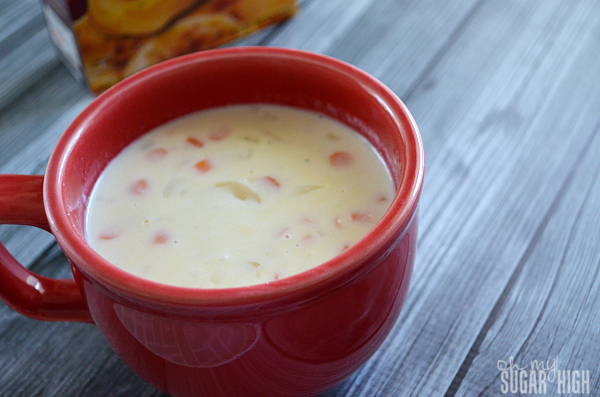 Do you have a favorite soup that is quick and easy? This is delicious I tried it the other day! Thank you.